On the 6th (Thu), contemplate the long history of Mehrangarh Fort and then look for gifts at Ganesh Handicrafts. 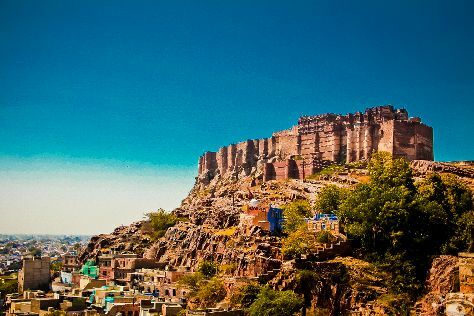 To see other places to visit, maps, ratings, and more tourist information, go to the Jodhpur travel app . Mumbai to Jodhpur is an approximately 3.5-hour flight. You can also drive; or take a train. Plan for a bit cooler temperatures traveling from Mumbai in December, with highs in Jodhpur at 32°C and lows at 12°C. Finish your sightseeing early on the 6th (Thu) to allow enough time to travel to Sawai Madhopur. A trip to Sawai Madhopur offers a range of exciting options, including a safari ride through a vast national park--home to the world's largest tigers--and access to a World Heritage-listed hill fort. Start off your visit on the 7th (Fri): look for all kinds of wild species at Ranthambore National Park. For traveler tips, other places to visit, ratings, and more tourist information, go to the Sawai Madhopur day trip app . Do a combination of flight and train from Jodhpur to Sawai Madhopur in 4.5 hours. Alternatively, you can drive; or take a train. Finish up your sightseeing early on the 7th (Fri) so you can catch the train to Jaipur. Attractions like Jantar Mantar - Jaipur and EleSafari make great kid-friendly stops. The adventure continues: take a stroll through Rusirani Village, look for all kinds of wild species at Elephant Joy, don't miss a visit to Hawa Mahal - Palace of Wind, and explore the galleries of City Palace of Jaipur. For photos, traveler tips, reviews, and tourist information, go to the Jaipur trip itinerary planner. Getting from Sawai Madhopur to Jaipur by train takes about 2.5 hours. Other options: drive. In December, plan for daily highs up to 30°C, and evening lows to 11°C. Finish your sightseeing early on the 12th (Wed) so you can travel to Udaipur. Start off your visit on the 13th (Thu): contemplate the waterfront views at Lake Pichola, then contemplate in the serene atmosphere at Jagdish Temple, then take an in-depth tour of City Palace of Udaipur, and finally take in the exciting artwork at Padmawati Arts & Handicrafts. Plan my day in Udaipur using traveler tips and tourist information provided by Inspirock. You can fly from Jaipur to Udaipur in 1.5 hours. Alternatively, you can drive; or take a bus. December in Udaipur sees daily highs of 29°C and lows of 10°C at night. Finish up your sightseeing early on the 13th (Thu) so you can travel back home.